Around 265 million years ago, much of the territory we now know as Texas was underwater, when the Earth's continents were combined into one vast landmass, Pangea, surrounded by ocean. The remnants of a huge reef from that distant era can still be seen today, as an 8,751-foot-tall mountain. Dozens of reefs across the world form vast mountain ranges—although underwater, it's sometimes difficult to grasp their scale. For instance, the volume of coral built up on the Enewetak Atoll in the Marshall Islands is around 250 cubic miles, which is equivalent to building the Great Pyramid of Giza more than 416,000 times. Writing in Smithsonian magazine, Olivia Judson says she wanted to appreciate "the full extent of a mountain of life," which prompted her to trek to the top of the once submerged Guadalupe Peak—part of a range of mountains that are among the most well-preserved fossil reefs in the world. Unlike contemporary reefs, which are constructed of coral, Judson explains that the builders back then were sponges, including the eight-foot-long Gigantospongia, which had an internal skeletal structure. Also assisting in the effort were foraminifera—single-celled organisms that have lived on this planet for 330 million years. They create their own elaborately shaped exoskeletons by extracting calcium carbonate from seawater and cementing the particles together with glue secreted by their bodies. The bit of Texas I'm sitting on was down near the Equator: Its current position of 32 degrees north latitude is the result of a long, slow drift. The sea that allowed the reef to form was an inland sea, connected to Panthalassa by a narrow channel. This channel was soon to be cut off; the sea would evaporate; the reef would be covered by sediments. In another 150 million years or so, another sea would come; but this too would disappear. Then there were upheavals: Although much of the original reef still lies buried, tectonic forces pushed the rocks bearing this piece of it upwards. Softer sediments washed away, exposing the harder limestone. Exposing the edifice built by living beings long, long ago. Fossils of at least 500 species that made their home in this reef have been found. If you ever plan a visit to the site, the National Park Service has even published a guide to identifying them, including Nautiloids where you can clearly see the interior chambers and partitions (below). 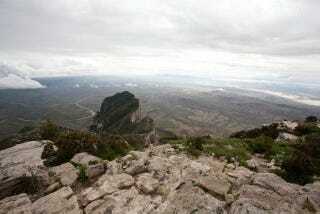 Read more about Guadalupe Peak and see more stunning photos at the website of Smithsonian magazine.